Home / Articles / 2019 / How Safe Is 'Clean' Food? At its best, the “clean label” movement has fostered health- and sustainability-conscious consumption, corporate transparency and considerable product innovation, many food industry experts agree. More and more consumers today, as a result, eat a wider variety of fresh fruits and vegetables and high-protein foods, read Nutrition Facts panels and ingredient decks, and try to reduce their sugar and salt intake—a boon to public health in a country with a high prevalence of adult obesity and dietary-related chronic diseases such as Type 2 diabetes and cardiovascular disease. But misconceptions underpin the movement as well, most notably the fear of chemical-sounding ingredients and additives that are unfamiliar to lay consumers but well-understood by food scientists. As the food processing industry rushes to reformulate products to appease consumers, a number of university-based scientists are raising concerns that removing or replacing time-tested preservatives could compromise food safety. In addition, some nutritionists worry that misguided anxiety over an ever-growing list of demonized chemicals distracts consumers from the importance of a balanced, nutrient-rich diet. In fact, food manufacturers have even removed vitamins and minerals from their products to “clean up” labels. In his 2008 book "In Defense of Food: An Eater’s Manifesto," activist Michael Pollan helped catalyze the frenzy for free-from foods with his warning not to eat anything containing unpronounceable substances that one’s grandmother wouldn’t recognize. During the past decade, bloggers such as “Food Babe” Vani Hari have further fanned consumer fears by condemning multisyllabic food additives in processed food. “There’s a lot of evidence that consumers find chemical-sounding words somewhat objectionable,” notes Jayson Lusk, who heads the department of agricultural economics at Purdue University, West Lafayette, Ind. The challenge, he says, is that industry efforts to be more transparent and comply with FDA ingredient labeling requirements have resulted in long lists of scientific names for substances in food. Noting that healthful diets can include processed as well as fresh food, Petitpain argues that food manufacturers need to do more to educate consumers about why particular ingredients and additives are used in specific food products. 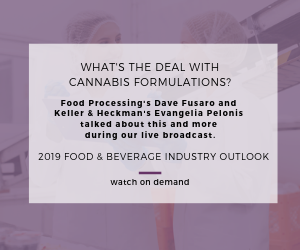 To remain competitive, many food processors, meanwhile, have been busy simplifying ingredient decks and trying to eliminate or reduce synthetic food constituents, often replacing them with naturally derived counterparts. Michael Doyle, retired professor of food microbiology and former director of the University of Georgia Center for Food Safety, acknowledges that not all the additives traditionally used by the food industry are absolutely necessary, but they do serve a purpose. “Some are for functionality. Some are for stability. Some are for color,” he points out. Doyle has many concerns about the removal and replacement of tried-and-true, proven-safe antimicrobial preservatives such as potassium sorbate and sodium benzoate. Sorbate and benzoate are also highly effective against Listeria, Salmonella and other harmful microbes, adds Doyle, co-author of “The Challenges of Eliminating or Substituting Antimicrobial Preservatives in Foods,” an article published in Annual Review of Food Science and Technology in February 2017. Some of the substitutes for standard antimicrobials are less potent and reliable, according to Doyle. He notes that vinegar, which contains acetic acid, is commonly used today as an alternative preservative. Clean-label ingredient producers such as Amsterdam-based Corbion and Kemin Industries in Des Moines, Iowa, insist that their vinegar-based antimicrobials are highly effective, however. Newly Weds Foods (www.newlywedsfoods.com) has a portfolio of natural food safety ingredients, most of them based on rosemary, vinegar and lemon juice. NatureIn, for example, are liquids based on buffered and reacted vinegar or in combination with lemon juice concentrate. It acts a general antimicrobial and is effective against listeria. It can be added directly to the product surface or in brines. Kathleen Glass, associate director of the Food Research Institute at the University of Wisconsin, is just as enthusiastic as Doyle about traditional preservatives. However, as the clean label movement gained unstoppable momentum over the past 10 years, she and her colleagues have been working with ingredient companies to help them develop the safest and most effective natural solutions. “The ingredient companies we work with have been working very, very hard over the past decade in trying to find what are going to be good alternatives,” she explains. “What are going to be things that do work, and what are the limitations along with them? Among additives, sodium nitrite — used to combat harmful bacteria in processed and cured meats such as salami and ham — has long been the target of scrutiny. An increasing number of meat processing companies today are substituting celery juice for nitrites to produce so-called “uncured,” or “no nitrite-added” meat products. “Celery extract is high in nitrate, which has to be converted to nitrite to be effective as an anti-botulinim,” Doyle explains. “When you use celery extract, you need a bacteria culture to convert the nitrate to nitrite.” He says that premature spoilage has occurred because of insufficient nitrite in uncured processed meat; the nitrite level is more difficult to precisely control when it’s produced bacteriologically rather than synthesized in a laboratory. One hallmark of the clean label movement is the widespread belief that “natural” equates to “safe,” Kaminski observes. “That is a wrong premise,” he insists. “Just because something is natural doesn’t mean it’s safe.” The large number of outbreaks of foodborne illness from fresh produce (both organic and non-organic) bears this out. Many people who seek out “clean food” prefer organically grown produce in large part because they believe it is free of synthetic pesticide residue. But in the absence of applied pesticides, “plants produce natural toxins to defend themselves against various stressors out in the field, whether insects or microbiological pathogens,” Kaminski says. Some of these toxic compounds can be “very mutagenic,” he emphasizes. Washing conventionally grown produce before consuming it will remove pesticide residue, according to Kaminski. “But those mutagenic compounds that organically grown vegetables are making — you can’t wash those out,” he maintains. No definitive, comprehensive study has been published indicating that organic food is more likely than non-organic food to correlate with foodborne illness. The Centers for Disease Control and Prevention (CDC) does not systematically collect information on conventional versus organic production methods through its National Outbreak Reporting System, which depends on state and local health departments to report foodborne illness outbreaks. And because “clean label,” unlike “organic,” has not been defined by USDA or the FDA, it would be much more difficult to conduct a comprehensive research study on whether clean label formulations and production methods have a higher relative risk for foodborne illness than their conventional counterparts. One study that has attracted the notice of food scientists and microbiologists, though, indicates a positive, statistically significant correlation between the number of farmers’ markets per million individuals and the number per million of total outbreaks and cases of foodborne illness. Published in the "American Journal of Agricultural Economics" in April 2018, the article Farmers Markets and Food-Borne Illness compares data on farmers’ markets by state from the USDA’s Agricultural Marketing Service and Farmers Markets Directory for the years 2004, 2006 and 2008-2013 with data from the CDC’s Foodborne Outbreak Online Database (FOOD) for the same years. “The correlation between farmers’ markets and foodborne illness just persisted in whatever I did with the data,” says the study’s lead author Marc Bellemare, an associate professor of applied economics at the University of Minnesota. The correlation is most robust between farmers’ markets and outbreaks and cases of norovirus, followed by Campylobacter jejuni. Receiving his research grant from University of Minnesota’s Healthy Foods, Healthy Lives Institute (www.hfhl.umn.edu), Bellemare initially aimed to investigate the accuracy of a common assumption that consumers make today “that local organic food is healthier.” Although farmers’ markets don’t just sell organic food, “I used that measure because I couldn’t find a good measure of organic consumption,” Bellemare explains. While not adding to research on the safety of organic foods, Bellemare’s study does call into question consumers’ health assumptions about the “farm-to-table” trend, another aspect of the broader clean label movement. No discussion of this movement can fail to take note of the growing consumer concern over genetically modified organisms (GMOs). Many consumers now expect clean label food to be GMO-free. Although there is no evidence that non-GMO crops are more likely to harbor foodborne pathogens, Wayne Parrott, a professor of crop science at the University of Georgia, has commented to the media on the detrimental removal of vitamins from certain breakfast cereals reformulated to be Non-GMO Project Verified. Because so many millennial and younger adult consumers today link their food choices with their moral values, not just long-term health, the food industry faces an uphill battle when it comes to convincing people that conventional food additives such as synthetic preservatives, as well as biotechnological innovations, help ensure better-for-you and safer food. Bellemare, who wrote an op-ed piece in The New York Times about his farmers’ market research, points out that while he received favorable feedback from many readers, a few were “pretty virulent in their denunciation of what I had written as being complete garbage,” as he puts it. Nevertheless, some food scientists and other food safety experts are trying to educate the public and take on “chemophobic” activists, as Lusk calls them. In January 2015, for example, several members of the Institute of Food Technologists Student Assn. wrote “An Open Letter to the Food Babe,” in which they called out her oversimplification of science. In his second book for the lay public, "Unnaturally Delicious: How Science and Technology Are Serving Up Super Foods to Save the World," Lusk extols the benefits of biotechnological innovation and directly addresses foodborne illness, which afflicts more than 15 percent of Americans each year, resulting in 3,000 deaths and 128,000 hospitalizations, according to the CDC. “The modern-day quest for naturalness in food sometimes runs directly at odds with food safety,” he wrote. Besides educating consumers, the food industry needs to understand the importance of corporate social responsibility in gaining the trust of millennials and Generation Z, Petitpain emphasizes. “A company’s reputation is reflected all the way down into minuscule details of a particular product,” she says. So, for example, if consumers admire a food manufacturer’s fair trade and hiring policies, they might be more inclined to believe that its product ingredients are safe and healthful.